Restricting web access – by user, web sites, time of day, etc. There are also a number of challenges faced when implementing proxies. Probably the top one is the job of configuring all of the web browsers to use the proxy, and then comes the problem of what to do if the proxy fails. This article presents a solution of web proxying which is transparent to the end-user – it requires no browser configuration. It is also resilient to failure, in that if the proxy server fails then web access continues to be provided without disruption. 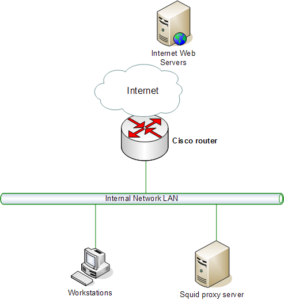 In the network drawing below I show a basic network with access to the Internet, this is a very common configuration for small business networks. In larger security-conscious organisations it is necessary to protect the proxy server against attack and misuse. This is usually performed by connecting the proxy into a DMZ network as shown in the next drawing. A common solution for transparent proxying is to have all outbound traffic pass through a server which will detect web access and redirect the request to an internal proxy. This has a number of problems – not least of which is that it can’t support multiple proxies, and when the server fails then all web access fails along with it. Most Cisco routers support a protocol called Web Cache Communication Protocol, or WCCP. This protocol is used by a proxy server, such as a LInux server running the Squid proxy, to tell the router that it is alive and ready to process web access requests. 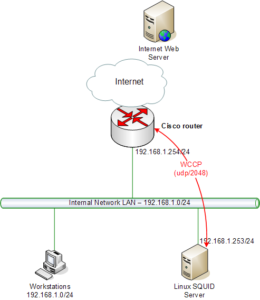 WCCP uses the UPD protocol on port 2048 – it is essentially a one-way communication from the proxy to the router. You can have multiple proxy servers. In fact, you can have almost any number if your router is big enough to handle them. This means for large organisation the load will be spread amongst them improving performance. Access is resilient to failure. If a proxy fails, then the router will immediately start using another (if you’ve got more than one configured), otherwise it will stop using proxies and forward requests directly to the Internet. The router can also be configured to block Internet web access if there are no running proxies available. Optimised hashing of URLs. When you have more than one proxy a user will request a web page that will then be cached by a proxy. The next time any user requests the same page, the router will send the request to the same proxy with the cached copy of the page. One caveat here to note though : WCCP is patented by Cisco, and is generally only available on Cisco routers and some high-end Cisco switches. A few other vendors such as BlueCoat also support WCCP, but not many. The Squid proxy sends a WCCP packet to the router every 10 seconds to tell the router that the proxy is alive and ready to receive web requests. You can now see here that it is easy to have multiple proxy servers that can work with the router. When a client makes a request for an Internet web page, it sends it directly to the Internet via the outer, as shown in (1) above. The router captures the request, encapsulates it in a GRE packet, and forwards it to the proxy as shown in (2) above. The Linux system un-encapsulates the GRE packet and sends the request to the Squid proxy by performing a Destination NAT operation on the packet – note that Squid now receives the original packet with its original source and destination IP addresses. 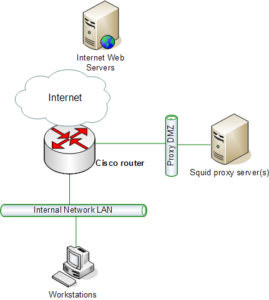 The Squid proxy now fetches the web page from the Internet server in the normal fashion shown in (3) above – it uses its own IP address as the source and the original destination IP address for the destination. Note that the router does not intercept and attempt to proxy this request. Once Squid has downloaded the page, it saves the data in its own cache, then replies directly back to the client on the internal network. And this is the tricky thing right here – when Squid replies it uses the IP address of the Internet server as the source in the packet, and the client IP address as the destination, this is shown in (4) above. So, while the client thinks it is interacting with the remote web server via the Internet router, in actual fact it is interacting with the Squid proxy which is caching pages behind the scenes. If another user on another client makes a request for the same page they go through the same flow, but because the page is cached there is no need for Squid to fetch the page from the Internet server again. In the remainder of this paper I will briefly show the Cisco, Linux, and Squid configurations required to get this working. Next we define another access-list to define direct or WCCP-proxied internet access. The proxies on 192.168.1.252 & 253 are denied access to WCCP, all other hosts on 192.168.1.0/24 are proxied when going to port 80, all others are denied. Denial implies direct access to the remote web server. Verify the configuration – it should be active on version 2 with no caches connected until the Squid proxy is configured.
! int f0 no ip wccp web-cache redirect in !
! int f0 ip wccp web-cache redirect in ! You can now go back to your Cisco router and check that the Squid proxy has registered with WCCP, with the show ip wccp command. Run ifdown gre0 and ifup gre0 to test it, then run ifconfig gre0 and verify the IP addressing. # to port 3127 on the local Squid server. You’ll need to run these are system boot time, add the commands to the start section of the /etc/init.d/squid script. tcpdump is your friend when testing this configuration. Check the flows in order shown in Figure 4 above and verify that each one works in order. Remember that the Squid proxy will use the IP address of the Internet web server when replying back to the client, so be aware of this. If your proxy is behind a firewall you will probably have to disable anti-spoofing mechanisms to allow the proxy to spoof the web server’s IP address. 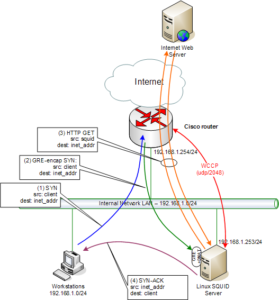 Most problems seem to occur in the Linux GRE & NAT configuration. And don’t forget to check the Squid logs for errors. In this paper I’ve described a method of transparently caching web requests using a Squid proxy and WCCP-enabled Cisco router. As described in the introduction this solution can be used to implement security controls and bandwidth management without having to reconfigure client systems to explicitly use a proxy server.